Not sure if this was reported elsewhere but Waterloo Kia is moving into the building formerly occupied by Forbes Toyota at Northfield and Colby Dr.
(04-26-2015, 09:52 AM)rangersfan Wrote: Not sure if this was reported elsewhere but Waterloo Kia is moving into the building formerly occupied by Forbes Toyota at Northfield and Colby Dr. There is presently no Waterloo Kia. 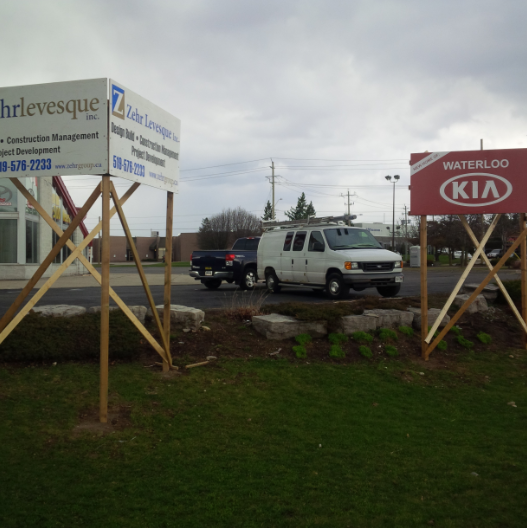 Is this the Kitchener Kia moving to Waterloo, or a brand new dealership? 151 Weber Street, South, Waterloo has a City of Waterloo sign (A-47/15) posted outside announcing a public meeting for a variance. The owners of the building currently have 68 parking spots and want to increase it to 138. There is a public meeting May 19. Is there a way I can get some information about this before the meeting? What's going up at Weber and Kinzie? (05-23-2015, 10:12 AM)greybird Wrote: What's going up at Weber and Kinzie? A new restaurant. It was posted a few weeks back but I've forgotten the name - seemed like it would be a pretty good place. Looks like a couple 3 story infill home being built on this site on Duke. The two houses at 390-400 Ottawa South (between the Orthodox church and the apartments on Hoffman) have been demolished over the past week or so, and the properties razed (including an impressive row of mature conifers between them). Not sure if this is a church initiative or a different developer. (06-04-2015, 12:41 PM)KevinL Wrote: The two houses at 390-400 Ottawa South (between the Orthodox church and the apartments on Hoffman) have been demolished over the past week or so, and the properties razed (including an impressive row of mature conifers between them). 570 news has a report that an after-hours urgent care clinic, Onyx Urgent Care, is opening this evening. It is located at 580 Lancaster W, which I think is the old Gallery on the Grand location, beside the Lancaster Smokehouse. It will be open from 1800hrs to 2300hrs and will be staffed by emergency room physicians. Anything to let one avoid emerg at Grand River seems a good thing. This is very good news for ER wait times, as long as people use it. The issue with ERs is the number of visits that are not emergencies, but that's another topic and another time hah. (07-02-2015, 06:37 PM)panamaniac Wrote: It will be open from 1800hrs to 2300hrs and will be staffed by emergency room physicians. Anything to let one avoid emerg at Grand River seems a good thing. ISTM an even better model would be to have such clinics located adjacent to or at least near existing hospitals and affiliated with them. That way people with non-critical issues who show up at Emerg can be sent "next door" rather than wait for hours (and hours and hours...) Likewise people who go to the clinic but are suspected of having more serious issues than the clinic can deal with can be routed quickly to Emerg. 1. Close proximity makes it much easier for the two facilities to share resources, be it doctors and nurses, diagnostic equipment and tests, etc. 2. Affiliation between facilities presumably better facilitates access to medical records without having to get a second set of consents, etc. Good points, although there's something to be said for having facilities available "close to home". I wonder if hospital emergency workers are allowed to suggest that people go to an urgent care clinic? (07-03-2015, 09:50 AM)panamaniac Wrote: I wonder if hospital emergency workers are allowed to suggest that people go to an urgent care clinic? Yes they are. At one time North York General Hospital had a clinic nearby. The triage nurses at Emerg would refer non-urgent incoming patients to that clinic. As I say, this makes no sense when Emerg departments are overwhelmed and overcrowded with non-emergency patients. Clearly there's a need and a demand, yet no one seems to be willing to meet it.